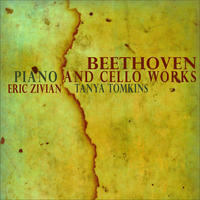 Tanya Tomkins and Eric Zivian: Beethoven piano and cello works. The Zivian-Tomkins Duo is a San Francisco chamber music ensemble specializing in music performed on period instruments. Extremely versatile, with experience in the Baroque, classical, and modern playing styles, Zivian and Tomkins are dedicated to the text of the music they perform. This has brought them together to explore the classical repertoire on the instruments for which the music was composed. After winning an international competition, they were awarded the production costs for their first CD, an all-Beethoven recording on original instruments. The duo performs well known and lesser known works, bringing an exciting combination of mastery and expression to their audiences. They are proud to be on the cutting edge of the original instrument movement that seeks to rejuvenate the music of the past by rediscovering some of its original boldness. Tanya Tomkins studied at the University of Southern California with Gabor Rejto and went on to receive her bachelor of fine arts degree from the California Institute of the Arts as a student of Ron Leonard. She moved to Holland to study with the cellist Anner Bijlsma and in 1987 earned a soloist's diploma at the Royal Conservatory in The Hague. Inspired by Mr. Bijlsma, Tomkins became interested in the performance of music on original instruments. As a member of the Trio d'Amsterdam (with clarinetist Eric Hoeprich and fortepianist Stanley Hoogland), she made a New York debut at the Frick Collection, which was recorded for National Public Radio and also appeared in Lincoln Center's "Great Performers" series in 1996. The trio recorded a CD for Koch. She has performed and recorded with orchestras such as The Classical Band (Sony), La Petite Bande (Harmonia Mundi), La Stagione Frankfurt (Harmonia Mundi), the Netherland Bach Society, Ensemble Bouzignac (Vanguard) and L'Orchestre des Champs-Elysees under the direction of Philip Hereweghe (Harmonia Mundi). During the fourteen years Tanya Tomkins was living in Holland, she was primarily active as a chamber musician, performing throughout Europe and the United States to critical acclaim. For five years she played with the award-winning Euridice Quartet. The quartet recorded a CD of the string quartets by Ravel and Debussy (Vanguard). She has also recorded a CD of French Impressionist music with the Renoir Ensemble, a harp quintet specializing in 20th century music. She has performed with the Amsterdam-based SoLaRe String Trio throughout Europe, the U.S., and Israel. Tomkins has been invited to play in many chamber music festivals throughout Europe and the U.S., including the Amsterdam Chamber Music Society, Rondje Romantiek and the Moab Chamber Music Festival in Utah. She has appeared as a chamber musician at the 92nd Street Y in New York and has played numerous times in the Concertgebouw Kleine Zaal as a recitalist and in chamber music concerts. She is currently a member of the Philharmonia Baroque Orchestra with whom she has appeared as a soloist, and she performs regularly with the American Bach Soloists. In 2001, she was the winner of the international Bodky Competition for Early Music Soloists. Currently, she is performing in recitals across the United States as the cellist in the Tomkins-Zivian Duo, a San Francisco chamber music ensemble specializing in music performed on period instruments. Eric Zivian was born in Michigan and grew up in Toronto, Canada, where he attended the Royal Conservatory of Music. After receiving a diploma there, he left home at age 15 to attend the Curtis Institute of Music, where he received a Bachelor of Music degree. He went on to receive graduate degrees from the Juilliard School and the Yale School of Music. He studied piano with Marina Geringas, Gary Graffman and Peter Serkin. He attended the Tanglewood Music Center as a performer in 1988 and 1989, studying chamber music with Gilbert Kalish, Peter Serkin, Joel Krosnick, and others. He has won numerous prizes for young pianists, including the Charles Miller/Sergei Rachmaninoff Award upon graduation from the Curtis Institute of Music and the Grace B. Jackson Award for Outstanding Achievement and Notable Contributions to the Program as a Whole at the Tanglewood Music Festival. Eric Zivian has appeared as a soloist in Toronto, New York, Philadelphia, and the San Francisco Bay area. He has performed Mozart and Beethoven concertos with the Toronto Symphony Orchestra and the Beethoven Triple Concerto with the Santa Rosa Symphony and the Festival Orchestra at "Music in the Mountains" in Grass Valley. Recently, he has begun performing on original instruments, and he owns two period fortepianos. 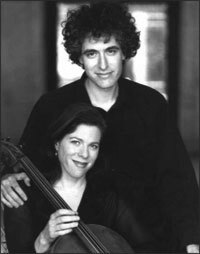 He is a member of the Zivian-Tomkins Duo, a fortepiano-cello duo that has performed in San Francisco, San Diego, Seattle, San Rafael, Berkeley, Davis, Boston and Washington, D.C. He is also a member of the Left Coast Chamber Ensemble and has performed with the Empyrean Ensemble, Earplay, and Alternate Currents. He is a frequent guest artist on the San Francisco Conservatory's faculty chamber music series. 크레이지슬롯 사이트Eric Zivian can also be found as a solo artist on Magnatune. Tanya Tomkins and Eric Zivian lives in Vermont, USA. Tagged as: Classical, Chamber Music, Classical Period, Romantic Era, Instrumental, Composer: Ludwig van Beethoven, Cello, Classical Piano.